"Caring for patients' body, mind and spirit." Dr. Princess Thomas, a native of Columbus, Georgia felt called to become a doctor during her very early years. Following graduation from Tuskegee University she obtained her medical degree from Meharry Medical College. During her general surgery residency at Mercer Medical she developed a passion for diseases of the breast. Her interdisciplinary breast fellowship at Yale University allowed her to hone her diagnostic and breast surgical skills, and take part in research leading to conference presentations and first authorship of several manuscripts. Dr. Thomas is a member of American Society of Breast Surgeons and Society of Surgical Oncology. She brings insight, passion and astute surgical skills alongside Dr. Winchester at Birmingham Breast Care. 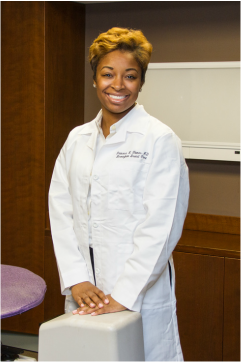 Dr. Thomas believes that caring for a patient’s mind, body and spirit is an integral part of her calling, and she exemplifies this ideal through her interaction with each and every patient. Her dedication to the best in care for her patients is further exemplified by her recent training enabling her to become Hidden Scar Certified. She believes strongly that providing a cosmetically pleasing result for her patients in additional to a medically appropriate surgery facilitates healing of the patient and eases the emotional impact from surgery. Call now to schedule your appointment to see Dr. Thomas.